India's historic inheritance endows it with many ancient customs and marriages are no different. Just like any other region in India, marriages are a grand affair in Orissa. 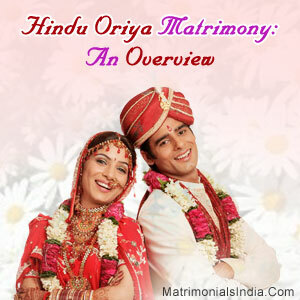 The Hindu Oriya Matrimony involves various customary practices that have been coming down through the generations. Though Hindus share a lot of the customs and beliefs throughout India, regional influences give them a distinct touch and identity. The main difference between the Brahmins and the Non-Brahmins of Orissa in terms of Matrimony is the fact that the Hindu Oriya Matrimony for the Brahmin community generally takes place in the daytime while the other communities start their marriage rituals from the evening. Wedding Costumes Of An Oriya Couple : The Oriya Bride generally wears sari in traditional colors like red, orange or magenta and fine gold jewelry while the Groom wears dhoti and punjabi in a bright assortment of colors. The Groom also wears the "jor", a white colored silk cloth draped around the body signifying purification. Pre-Wedding Ritual : Jayee Anukolo Ceremony It marks the initiation of the marriage rituals following which marriage cards are distributed. The first card is sent out to the family deity, which is Lord Jagannath. In most cases, this is followed by sending of cards to the close relations of the Groom and the Bride and subsequently to friends and relatives. Nirbandh : It is the engagement ceremony where the fathers of the bride and the groom share an oath to wed their children to each other. Mangan Tradition in : Oriya Wedding People bless the bride by applying turmeric paste on her body and this is followed by the bride`s ceremonial bath. Diya Mangula Puja : It is conducted at the Devi`s temple. The female barber offers the bride's bangles, toe ring, sindoor and sari to the Goddess. Barajatri & Baadua Pani Gadhua Custom : The groom, along with his marriage procession (known as Barajatri), arrive at the wedding venue with pomp and gaiety and are welcomed with aarti or tilak. In the Baadua Pani Gadhua custom, the girl's side informs the bride that the baraat has come and arrangements are made for her holy bath. The final custom is Kanyadaan that is the traditional ritual of handing over the daughter to the groom.